Great news everyone! Remember that game you all so loved, the new SimCity, what with its always-on requirements, Orwellian DRM, small scale, and general unpleasantness? Well now you can make it even better, with the first free downloadable content — a Nissan Leaf ad! Despite being completely awful, SimCity has still managed to garner over 1.3 million users, for what its worth. 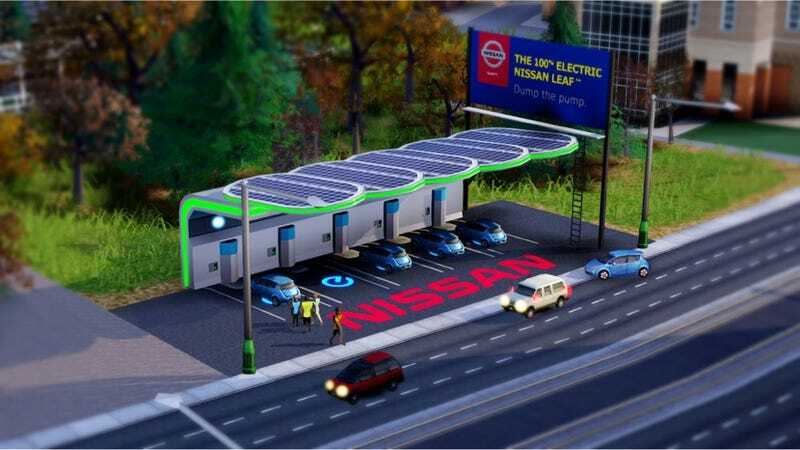 And now those users will be able to bask in the glow emanating from a Nissan Leaf charging station, which they can plop up to five of in their city, according to Carscoops. And what do you get for being so eco- and Nissan-friendly? Smiles, of course! Well, not smiles on your face, anyways, as it doesn't really add much to the gameplay. But smiles on the faces on the denizens of your city, as the charging stations add "happiness" to nearby buildings. Perhaps the best part is that you will see Nissan Leafs (Leaves?) being driven by all wealth classes in your city, not just the ones who have the disposable income to buy a second car that can go less than 100 miles on a charge and never need to take a road trip longer than that because hey let's all just hop on the private jet those are eco-friendly right I mean it's just got some jet engines? You can get the Nissan Leaf Charging Station pack now, but only for the next six months. Don't you all hurry at once though. You might crash the servers.